Play Yu-Gi-Oh! 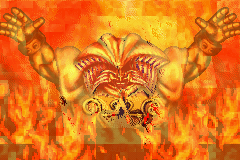 - The Eternal Duelist Soul online with Game Boy Advance browser emulation for free! Yu-Gi-Oh! 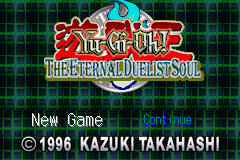 - The Eternal Duelist Soul (GBA) game rom is loaded with features in our flash, java and rgr plugin emulators. Nothing to configure, we've done it for you! The most accurate, advanced version of Duel Monsters arrives! The ultimate duel simulator based on the hit Trading Card Game and Television series! Duel against dozens of opponents from the TV show or challenge your friends. Import cards from the Official TCG to boost your deck. Complete your card collection and create the ultimate deck to enter the World Championship Tournament! Violence is within human nature, for humans have had the lust for power and inflicting violence upon those that are weaker. Even the great Roman rulers felt this for, among their infinite achievements, they built the Colosseum to witness the violent nature of humans (watching their "will to survive" by unleashing said nature) out of pleasure. Over time, the concept of civilization tempered this blood lust, and humans found alternative ways to vent and feel empowered. Oddly enough, the past time of card games would become a vague way to feel powerful by leading legions of armies, such as in Yu Gi Oh. Card games got a lot of potential for video game releases, as it is much more portable and affordable than collecting hundreds or thousands of cards. However, many card games made sloppy transitions and often die out quickly. For instance, the Pokémon Trading Card game saw one North American release, and its sequel being a Japanese port only. Both of these games, while decent ports, were still fairly sloppy and it shows. However, unlike the Pokémon Trading Card Game, Yu Gi Oh flooded the Game Boy Advance. As a result, it is difficult to sort through the good, the bad, and the ugly. How does this particular game compare to the plethora of other titles? This is a bit of a complicated game to newcomers, so before going on an explanation is required. This brief explanation will not go into most of the rules, as that would take too long. If one is already familiar with the card game, then they can skip ahead to the following paragraph.The basic premise of Yu-Gi-Oh is to build a deck of 40-60 cards to wage battle against other deck-wielding strategists and to try and beat them by lowering their life points to zero. The deck would consist of monster, magic and traps cards, and each turn the player would lay them onto the battlefield. A player can lay a maximum of 5 monster cards, and 5 magic/trap cards (which would share the same space). Monster cards can be laid in either a defensive or offensive position. 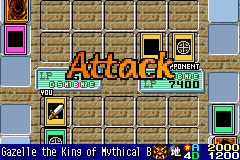 The offensive position, as the name implies, allows for the monster to attack but the defense position prevents the loss of life points if defeated. 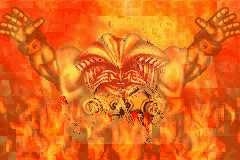 In the event of no opposing monsters on the opponent's side of the battlefield, then the attacking monster could attack the life point's directly. 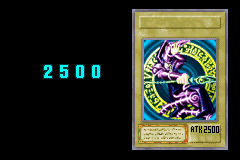 The magic cards and trap cards could be said to be the supply lines if monsters were front line soldiers, as they provides essential support (such as raising stats, reviving fallen units, destroying opposition, and the list goes on) and the usage of magic/trap cards are a huge part of the strategy. That is the game, in the shortest and simplest terms. Visually, this is debatably one of the best games from the Yu Gi Oh handheld games. While the game did not attempt to make usage of 3d rendering, it did not need to. If it was a trade-off between 3d graphics, and clarity, then clarity wins by a wide margin in this case. The fact of the matter is that this game is one of the clearest, and it isn`t a nightmare trying to figure out what to do to initiate a certain event. The color scheme is very clear, and doesn`t hurt the eyes. Animations are limited but, as this is a card game, unnecessary. The ones that do exist are fluent and pleasing. Overall, for what the game was trying to do (aka represent the card game in a straightforward and pleasant manner) the graphics succeed perfectly. Sometimes less is more, and this is a perfect example. The audio, however, is the exact opposite. The biggest problem with the audio is that it is very ill suited. The Pokémon Trading Card Game was similar, but Pokémon was generally a bit brighter than Yu Gi Oh anyways. It is very repetitive and just weak. The sound effects can also be perceived as annoying, and ill suited. The sound is very subjective, but overall it just doesn't work well. Something that is very uncharacteristic compared to the other games in the plethora of ports is that this one has an exceptionally vague story, if one at all. The story is more-less a kid who is getting into the game goes to the local card shop to play with other people...and this works very well. The other games either tried to mimic the anime/comics or tried to spin their own massive stories, but this game kept it simple and to the point. In many regards, this makes the story more realistic (as it implies that the game unlike in the Pokémon Trading Card Game that its a world obsession) and in some respects stronger. While it would have been nice to see it a bit further, it works. However, as the story isn't the main focus, the game play takes that position. 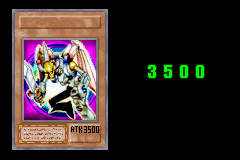 The shortest way to describe it is that it's Yu-Gi-Oh.It is essentially a near perfect transfer of the card game, only the card selection is more likely varied than the average kid's. That is what makes this game work: it doesn't try to pretty up the formula of the original card game. How does it hold for people just getting into the game however? As far as tutorials goes, it is the polar opposite of Pokémon Trading Card Game. Whereas that game had a very in-depth mandatory tutorial, this game doesn't have one at all. While this does cater to some people who prefers to learn as they goes along, an optional introductory tutorial for those unfamiliar with the card game. This game caters to those familiar with the series, and lays down subtle hints that the player may recognize yet...it would have been nice to see more to cater to people who just randomly came across the game. That doesn't say that people who isn't a fan won't enjoy it. The game encompasses a large amount of strategy, and anyone who likes utilizing a vague amount of their mental capacity would enjoy this game. The difficulty levels are hit or miss, partially depending if the player uses the passwords or not. Each password would summon a single card, and the lists are readily available with the Internet. However, it is 100% optional, and the player could opt to simply play with the cards they win (after every won game, they gets a pack of five cards). Early on, the opponents are easy but as time goes on the adversaries and their decks grows more elaborate and complicated to battle, requiring an "evolve or die" philosophy. Battles could either range from easy as can be, tremendous battles of epic proportions. This game is also addicting. It is one of those games that once picked up, it is difficult to put down due to the nature of the battles and the desire to just get better and "collect them all" to steal the Pokémon term. Actually, the focus is more to become powerful rather than collect every single card. One thing also worth noting is this game is entirely oriented towards multiple players. It makes sense, but a real kick in the gut for the gamer who prefers single player campaigns: most of the menu options are oriented towards two or more players getting together and having a blast between trading or having games. There is absolutely nothing wrong with this, but as Vizzed lacks multiplayer at this point, it reduces the actual value of the game. In short, this is an extremely solid Yu Gi Oh video game. This is a game that really has to be played to believe or understand, but if someone enjoys Yu Gi Oh, or strategy games, then this is one that should be believed. All in all, it's recommended. It has its flaws, like the audio, but the technical prowess makes it completely worthwhile, albeit the soundtrack for "The Gladiator" would be much desired with the browser set on mute. It's recommended to try this game, and it's recommended to learn what it means to have a full developed deck to conquer your adversaries and make them feel one's terrible vengeance and furious anger. It is what is, and it's a solid card game worth trying. Yu-Gi-Oh! 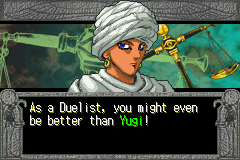 : The Eternal Duelist Soul is a card game with role-playing elements, aiming to imitate the rules of the Yu-Gi-Oh! card tournament. 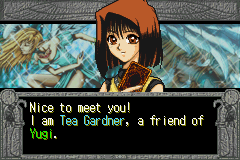 The player controls a young boy destined to be the greatest duelist of all time. The protagonist starts with one of the three starter card decks, and proceeds to challenge and battle duelists in five different levels. Cards represent various monsters, which have their own statistics, strength, and weaknesses, and are used strategically during the turn-based battles. The game keeps track of the time passed: battling a duel will usually advance the calendar one day forward. Should the protagonist survive for long enough time, he will be able to participate in bigger tournaments. New cards, deck combinations, and booster packs can be acquired as well. Enter these codes to unlock these monsters. Also, what button do I need to press to believe in the heart of the cards? I can't seem to get that to work in this game. kre-akalyn_sci4 - Nope. everyone thats wondering about link battle, you can't because handheld gaming systems *gb, gbc, gba, gamegear* can't netplay. so is there no way in hell to use the god cards? anyone want to duel? if you do. then i might be ready even now i am.